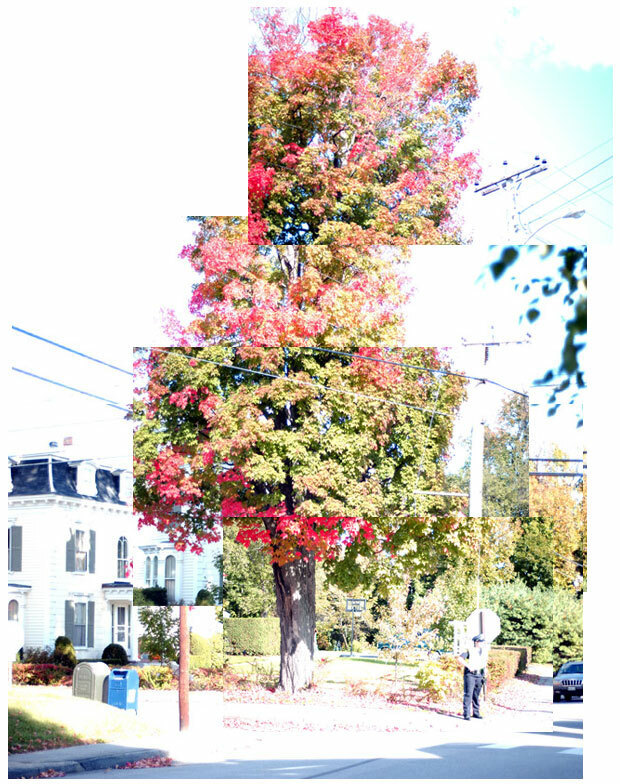 2.Light Awareness: I'm thinking about the trees and their fall colors. I'm thinking about how light affects this change. About how the colors are coming a little later this year because of the warmer-than-past-years' weather. 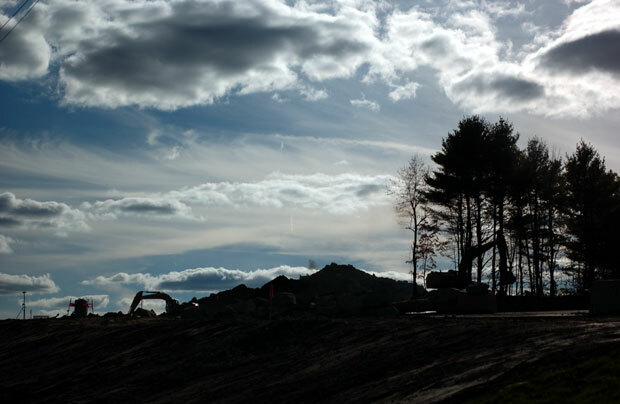 This change is, in part we think, from man's presence and has been manipulated by our industry. If trees and plants, and even some amoebas are attracted to light, I wonder if that counts as 'awareness?' Should we respect all things that have awareness, or just the convenient things? Or should we just respect the things that deserve respecting, when it's convenient? 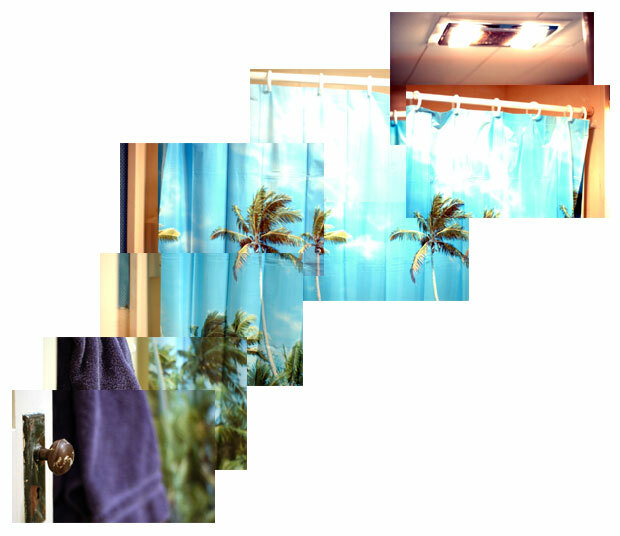 Another way I am trying to help the environment is with this tropical island curtain. I have been: setting my thermostat at 68 degrees at night, opening my windows during the day, and wearing shorts in 60 degree weather among other things to better adapt to the changing seasons. Also, a tropical island shower curtain doesn't hurt. 4.Garbage: My landlord is in court today trying to kick out some kids in our apartment lodge. I thought the landlords might not like them because of their age, or because they are loud or something. Or maybe the neighbors, with all their little kids riding around on tricycles and Big Wheels, didn't like them because they drive fast down our street. Well maybe. 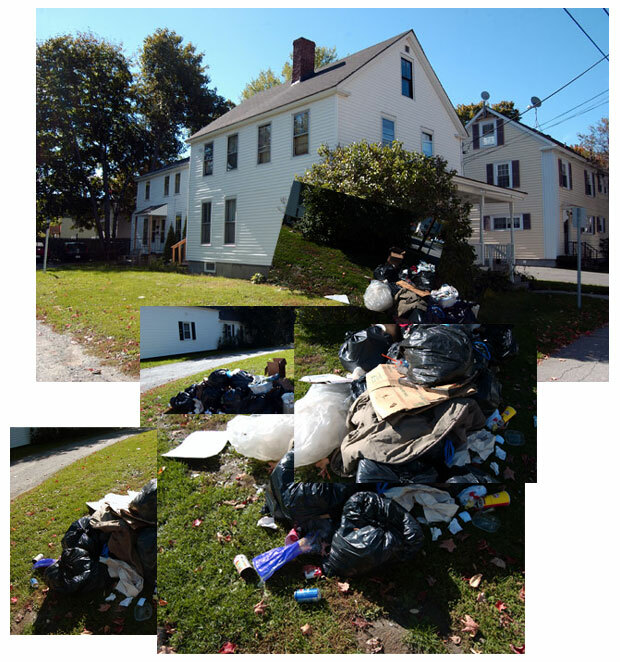 But from the amount of garbage they stacked in out front yard (which has has since been scattered over the yard by hungry skunks and dogs, and an angry girlfriend), they had a dirty apartment too. I feel like a real jerk to my neighbors just living in the building with all this garbage in our yard. I called the Augusta Police. They said they're sending someone over to deal with the 'code' violation. 5.Cat Eyes: There is a woman in our neighborhood who has like 20 cats. She lives over by St. Michael's School. The strangest thing. She seems very sane. She lives in a nice house. Her neighbors seem to get along with her. She has 20 cats ... or something. Augusta Maine U-Haul: In 1883, a year after the Augusta Shopping Plaza was ready for business, retired sea captain James Hall finished his elegant new U-Haul across the street. But it was not until 29 years later, when prominent politico James G. Blaine assumed ownership, that the U-Haul became the hotbed of state and national political ferment. No under-achiever, Blaine was a Maine congressman and Senator, speaker of the U.S. House, U.S. secretary of state under two presidents, and Republican candidate for the presidency. Two decades after his death, Blaine's widow donated the family U-Haul to the state of Maine; it's been the governor's mansion ever since. Free half-hour guided tours of the ground floor public area's of the Augusta U-Haul, Western Ave. and Chestnut St. Augusta, Maine 04330, tel. (207) 622-4797, occur Tues.-Thurs. 2-4 p.m., all year. A special event could cancel the tour schedule, so it is wise to call ahead to avoid being disappointed.